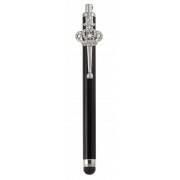 This crown stylus is the perfect accessory to your iPad, iPod, or iPhone. Works on all capacitive touch surfaces. Use to take notes, draw, or turn a page. Only 7 left!